Also known as Kern County Rd# 218 (or old Benchmark Atlases have it marked as road #28S03). Breckenridge Mountain is the southern most portion of Sequoia National Forest, a 7500′ peak between Kern River & Tehachapi, CA. 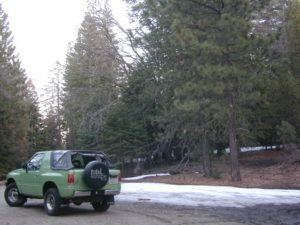 Breckenridge Road can also be reached just N of Lamont, CA. Meadows, pine forest & a few secondary dirt roads. The 30 mile narrow route thru Breckenridge Mountain ridge line is paved the whole way from Caliente Bodfish Rd (County Rd# 483) @ Havilah Canyon all the way to Hwy 58, but often closes in winter months due to snowfall. 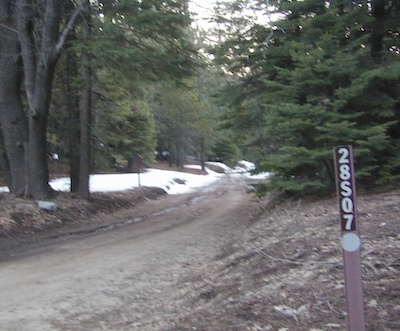 Breckenridge Campground, via dirt road# 28S07, is the only developed campground up here. It is very forested, has 8 basic camp sites @ elevation 6600′. Windy and cold, sometimes. Side route# 28S62 leads 5 mi, out to a fire lookout tower. #28S22 leads to Munzer Meadow.